New York: Ace Double Books D-15, published 1953 and bound with Maurice Helbrant’s Narcotic Agent, attributed to William “Lee” as Burroughs used his mother’s maiden name so as not to discredit his family. Maynard & Miles A1a, in which they note that as many as 100,000 copies may have been printed. Certainly this title is not hard to find, but it was printed on poor quality paper and excellent copies carry a high price premium as they are scarce. It is particularly interesting that even for Burroughs’ first published work, there was concern by the publisher about the subject and contents which was only overcome by the inclusion of the Helbrant’s Narcotic Agent. 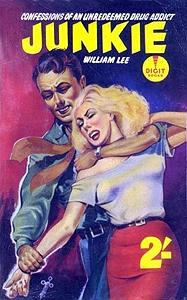 This was a title originally published in 1941 and one assumes that acquiring the softcover rights was done cheaply since Narcotic Agent was apparently not a big seller. 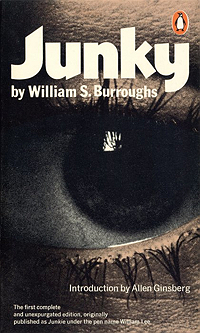 But legal and moral concerns about Burroughs’ writings would follow him well into the 1960s. London: Digit Books 1957, Maynard & Miles A1b. One of the most difficult of all Burroughs books to locate, especially in collectible condition. New York: Ace Star (K-202) 1964, first separate publication under the name Burroughs and first issue with price of 50¢. Somewhat lurid cover art shows a drug user (?) crouched and leaning against a wall. The publisher’s note was expanded for this edition, and a foreword by Carl Solomon added. Ace Books surely felt they were sitting on top of a goldmine as they trumpeted the blurb “By the Author of Naked Lunch” on the front cover. And they were right as a quarter million copies of this title were sold over the next decade. Maynard & Miles A1c. _____ 1964, re-numbered (41841) reprint of the above with a 60¢ price, bound in wraps. London: Olympia Press / New English Library 1966, bound in stiff olive-green wraps, one of 5,000 copies. Maynard & Miles A1d. London: New English Library 1969, second British printing in wraps. Curiously, Maynard & Miles do not provide separate entries for the New English Library editions (all under A1c), ostensibly because the 1966 Olympia Press edition was distributed by New English Library. At any rate, both the 1969 and 1972 (see below) editions feature different artwork on the covers. Both had print runs of approximately 5,000 copies each. New York: Ace Books 1972, new cover design, still rather lurid, with blue-jeaned addict nodding out on a doorstep. London: New English Library 1972, third British printing in wraps. London: Bruce and Watson 1973, first thus British printing and rare (for this title) in hardcover, with pictorial dust jacket, one of 1,500 copies. Maynard & Miles A1e. New York: Penguin 1977, first printing in pictorial wraps. Includes material not found in the original Junkie. The first unexpurgated edition thus, and first to use Burroughs’ preferred spelling of the title with a ‘y.’ Introduction by Allen Ginsberg. _____ later printing (25th printing ,1987?) in pictorial wraps with a different cover design. London: Penguin-UK 1999, first thus British printing in newly decorated wraps. London: Penguin 2002, new British edition with a new Introduction by Will Self, bound in wraps. New York: Penguin USA 2003, so-called “50th Anniversary Edition” contains a new Introduction by Oliver Harris as well as Burroughs’ own unpublished Introduction and an entire omitted chapter, along with many “lost” passages and auxiliary texts by Allen Ginsberg and others. Bound in wraps, no hardcover edition issued. _____ Advance Uncorrected Proof copy, bound in wraps. Hello, I’m trying to find out who the artist was for the illustration on the front cover of the 1969 New English Series 2488 edition, as I’m trying to seek permission to use in a film. I don’t find any reference to the artist. The title page says N E L Books are published by The New English Library Limited, from Barnard’s Inn, Holborn, London, E.C.I. Made and printed in Great Britain by C. Nicholls & Company Ltd. I red this Book back in 1974-75;(it was a Greek translation and it had a great effect on me ) Now it’s 2018 and I’d like to read it again to see what I will make of it! Should it give me a similar stimulation? Am I going to still love it? So I wonder if there is still a possibility to buy a copy of this book! Anyone that can help me to buy a copy of from the 1959 edition, because that’s the one that I red!Thanks a lot for any help!! I obtained a very good copy of the Ace K202 edition; what is its approx value? I see wildly different prices on Amazon, Ebay, etc. That is the paperback from 1964. They printed and sold a ton of them. Call it $35-$40 for collectible condition. Bummer. I see it on EBay for $165. It’s the edition with the price as 50 cents, and serial number K202 printed in green ink. Thanks for your assessment. Yeah sorry. I think I see the one you are talking about. It is misdated as 1953 too. Wonder if they are trying to scam people or if it’s just innocent mistake. In any case, I will not be trying to get at least $80 for my copy as I had planned (glad I checked here). More like $15, to a bookstore who will resell it..